I’m a really shy kinda guy. No, seriously. Not exactly a wallflower, and I’m OK once I get going. But it’s that first ‘hello’ and stuff I find difficult. Not terribly good at ‘breaking the ice’. I mentioned that in I’ve had my knob shaved. So I always like ‘icebreaker’ tips. Something that just helps a little – I really admire people who can just start up conversations. And I don’t mean creepy or weird. Like the guy who asked me if I liked ‘The Shadows’ and told me all about his complete collection of their records, and every time that he’d gone to see them. He meant well, but that was a conversation that wasn’t going to go anywhere. I drove someone home once and he innocently asked what the noise in the boot was when we turned a corner.. ‘The bodies’ I joked. Understandably, he got a little uncomfortable. Not my best small talk. So I’m always looking for tips to help me out. I’ve been on confidence building courses, I’ve been on a ‘flirting for fun’ workshop (loved it despite the rice cakes…) and done lots of lovey theatre ‘learning to trust/get to know you games’. And I bought a book called How To Talk To Anyone by Leil Lowndes (HarperCollins, 1999). It’s a delightful little treasury of developing small talk and conversations with strangers. It’s not a bible, but it does have some tips I really like. One of them is about whatzits. What’s a whatzit? A Whatzit is anything you wear or carry that is unusual – a unique pin, an interesting purse, a strange tie, an amusing hat. A Whatzit is any object that draws people’s attention and inspires them to to approach you and ask, ‘Uh, what’s that?’ Your Whatzit can be as subtle as your personality and the occasion permit. I prefer to call it a thingummybob. Mine is my ‘cancer watch’ (I know, that’s as bad as the bodies in the boot small talk, but bear with me). 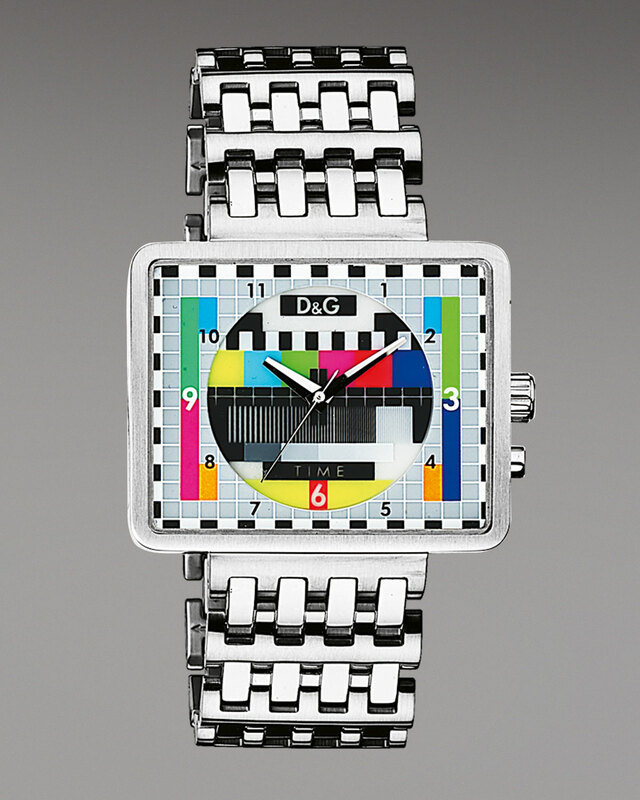 It’s a D&G watch with a design that reminds me of the ‘testcard’ that that used to be broadcast on British TV whenever programmes were off-air. I saw it in the jeweller’s that exists in my local hospital (yes, really, a jeweller in a hospital – presumably for all those death bed proposals from the terminally ill in need of an engagement ring in a hurry.) while I was having treatment for my cancer. It caught my eye, and it reminded me of whatzits. It really works. As a conversation starter, it’s perfect. Eye catching, and I can choose how much of its story to reveal – an innocent conversation about TV nostalgia, a conversation about bling and D&G, or a deeper connection about my cancer treatment. It’s my most successful thingummybob to date. I haven’t dared to wear my thingummybob #2 – a badge that says ‘I f*ck on a first date’. Like I said, I’m a really shy kinda guy … just look out for my thingummybob. This entry was posted in Uncategorized and tagged bling, cancer, d&g, first date, leil lowndes, shy, small talk, the shadows, thingummybob, wallflower, whatzit.